Google’s venture into augmented reality has finally come out into the light of day. The Android-running device are glasses that aren’t really glasses, but more like frames with one small lens over the right eye and a camera. That lens provides a heads-up-display which overlays the wearer’s frame of view. The glasses have all the features expected from a mobile device: messaging and chat, photo and video, wireless connectivity, GPS and location services, and music. The team working on the device for the last two years is Google[x], which is the same group working on the self-driving car recently profiled here. 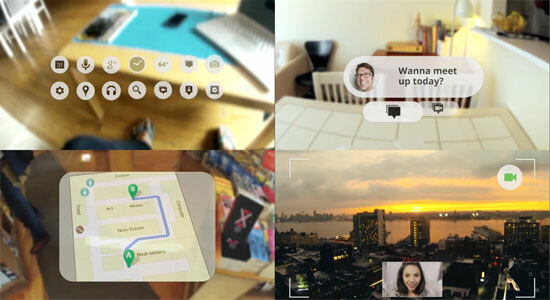 While few details were provided in the announcement on the project’s Google+ page, dubbed Project Glass, a few photos of the sleek design were released along with a video showing what a day in the life of augmented reality might look like. It’s a pretty sweet take on what the future might hold with hands-free computing. One of the biggest surprises with the glasses design is how unobtrusive they are, a far cry from the clunky headgear that had been previously suggested. Other companies that have dabbled into similar types of mobile headgear, like these RID glasses from Brother Industries, the NTT DoCoMo AR Walker device, or the Vuzix Wrap920AR glasses, appear much larger or block a significant part of the wearer’s field of view. Additionally, there’s the issue of market traction with these devices, which likely would relegate them to the hobby market, but in Google’s hands, augmented-reality devices could easily go mainstream, especially as rumors abound about the possibility of a Google Online Store for Android devices around the corner. Though the video shows an incredibly well thought-out HUD design that’s interactive and as multifunctional as any mobile device, these glasses are far from being ready to hit the market. The Project Glass announcement was careful to say that the images of the glasses are intended to show what this technology “could look like” and the video demonstrates what it “might enable you to do.” Back in February, the New York Times reported that the glasses would be on sale by the end of the year, but Google has stricken down that timeline. But the excitement over the possibilities of this technology also bring a slew of concerns, the least of which is the onslaught of privacy issues. Just consider how much chatter about privacy was stirred up by a Cult of Mac article about the Girls Around Me app. Then there’s the more technological issues, such as durability, sizing, battery life, and, of course, cost. Finally, the word still isn’t out about whether cell phones cause brain cancer, so the health concerns over glasses that might be worn as long as corrective glasses could be enormous. It makes sense then for Google not to reveal any hard details about the device, and keep everything in the concept realm. Ultimately, this latest announcement is intended to excite public interest, get feedback, and assess demand along with coming up with strategies to deal with resistance to the technology. It’ll also answer any questions from people wondering what those things are that early Google testers are wearing around town and potentially acting goofy as they interact with virtual objects in real surroundings. Additionally, Google just might be trying to create a bigger shift in the current mindset about technology. Back in 2010, Steve Jobs proclaimed Apple’s version of the post-PC world with touch screens and cloud computing. So, the question is, is Project Glass just another Google side project that will recede from the spotlight or Google’s vision of the post-PC era? As with most things Google, it’s hard to say until it hits the shelves.